Weekly Fishing Report - Swanning About? There were a lot of battles on the water this week at Lochter, not all of them piscatorial. 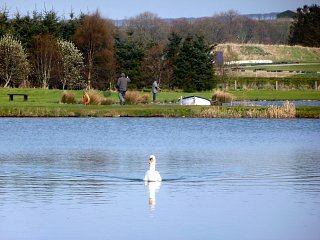 There was a constant Skirmish between our resident pair of swans continually having to see off several rivals who had thoughts of a comfortable winter berth at the Fishery. I can report that our resident pairs efforts paid off and they still reign supreme and are currently diligently patrolling their beat. All was not plain sailing for those casting a fly on the water. The fish were found to be a bit pernickety with a lot of fishers reporting half hearted takes and the fish constantly changing what they were feeding on, so there was some frustration to be had. However, for those who persevered, a lot of good sport was had, with the feedback being that the fish were in ‘fine fettle’ and ‘ fighting hard’. Peter Young had 11 fish for his day on the WSW and ‘other black lures’, Matthew Reilly had 10 also on WSW as well as the Semtex lure, Nathan Hutchison used the black ant to land 10 fish and Fred Mitchell had 10 on buzzers and reported having an ‘excellent’ day. Bill Gibb on his two outings during the week had 8 and 11 fish respectively on a mixture of buzzers and diawl bachs and put down on the returns book that he had a ‘great day trootin aboot!’. Other assorted returns were Alan Morgan with 9 on bloodworms, Harry Kemp getting 6 on buzzers and diawlbachs and Craig McLean finishing with 9 on bunny leeches. A wise angler once regaled that the charm of fishing is that it is the pursuit of that which is elusive but attainable, a perpetual series of occasions for hope:- so don’t lose the faith!